This Blue Ridge Parkway Foundation program helps get kids and families “un-plugged”, outdoors and actively engaged in nature, for their health and the health of our parks. Each TRACK Trail provides a series of self-guided, brochure led adventures designed to turn an ordinary hike into a fun-filled adventure. Kids who register their TRACK Trail adventures on the KIDS IN PARKS WEBSITE become members of the program’s Trail TRACKer Team and earn prizes designed to make their next adventure more fun. The Rockfish Valley Kids in Parks Track Trail in Nellysford at the Rockfish Valley Foundation’s beautiful Rockfish River Trailhead on Route 151, 1.5 miles south of Nellysford. This is another of the Blue Ridge Parkway Foundation’s Kids in Parks Track Trail programs of self guided outdoor opportunities for kids and families to connect with nature. The Rockfish Valley TRACK Trail is a flat, 1mile loop that follows the South Fork of the Rockfish River and Reids Creek. The trail features riparian, field and bog habitats and offers excellent opportunities for wildlife viewing. 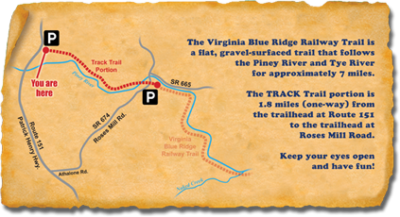 The trail was made possible with grant support provided by the Virginia Department of Conservation and Recreation and the Virginia Museum of Natural History. 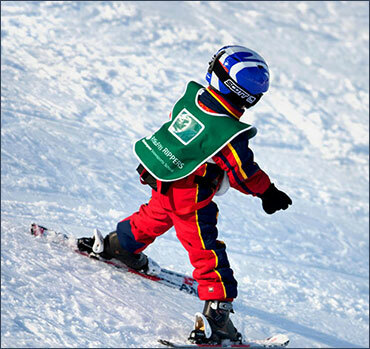 Wintergreen Resort’s nationally recognized children’s programs make it the perfect mountain resort for extended family vacations. Designed with activities for all ages, our year-round kid vacation calendar includes family campfires and storytelling, holiday weekend events, games, activities and great winter sports. During the Summer months a variety of family activities are available and planned each week. Families can look forward to outdoor movies under the stars on the big screen, candy bingo, workshops, campfires, storytellers and s’mores! The Montebello Fish Hatchery is a few minutes west of Crabtree Falls, an amazing place to visit with the whole family. There are separate holding pens for the different species of fish, as well as the different sizes. This hatchery produces and stocks streams around Virginia with 150,000 Brook, Rainbow and Brown Trout each year. Watch the excitement of the kids when they toss their first handful of fish food into a pen. The trout will swarm as they all race for the food. A fun activity for the family and educational too! Take the kids to Montebello and catch some Rainbow Trout in the fee base trout ponds. An assortment of fishing poles both adult and children sizes, fishing line, a variety of lures as well as live and artificial bait available in the country store. No license required. Kids will love the adventure of picking delicious strawberries in the spring at SEAMANS’ ORCHARD or picking blackberries in the summer at HILLTOP BERRY FARM & WINERY. All locations have easy access and well-manicured fields that offer a special treat for kids. Be sure to check out the EVENTS CALENDAR to see what is happening in our orchards and farms. During the Fall, there are many festivals and opportunities for kids to enjoy the local orchards to pick a special pumpkin or a favorite apple at the county orchards. 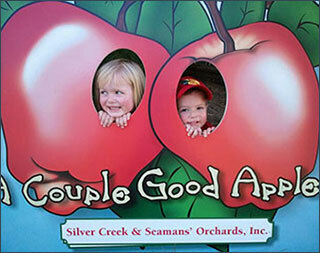 Check the EVENTS CALENDAR for dates and activities for kids at these orchards: DRUMHELLER’S ORCHARD, SEAMANS’ ORCHARD, DICKIE BROTHERS and SAUNDERS BROTHERS. Appalachian Horse Adventures in Montebello offers horseback riding (ages 6 or older) or horse drawn buggy rides on trails that wind down country roads, through scenic forests, and past trickling streams. Rebel’s Run in Afton has scenic trail rides, vineyard trail tours, English and Western riding lessons for all ages and summer riding camps. Rockfish Valley Foundation Natural History Center is open every Saturday and Sunday. It features exhibits from the Virginia Museum of Natural History. Exhibits include an array of taxidermied native wildlife. Young visitors will have the chance to experience animal pelts, insects, rocks and other artifacts. Spruce Creek Park and six miles of trails in Rockfish River Trail System are open dawn to dusk. Come visit!! Featuring nature exhibits, scenic and informational hikes and educational programs for kids. Everyone is welcome to come visit The Trillium House to check out our archaeological exhibit, our California King Snake, Robin’s Nook for children, and much more! Swimming at Lake Monocan is available from Memorial Day Weekend through Labor Day. Members and all registered resort guests have complimentary access to Lake Monocan Park. 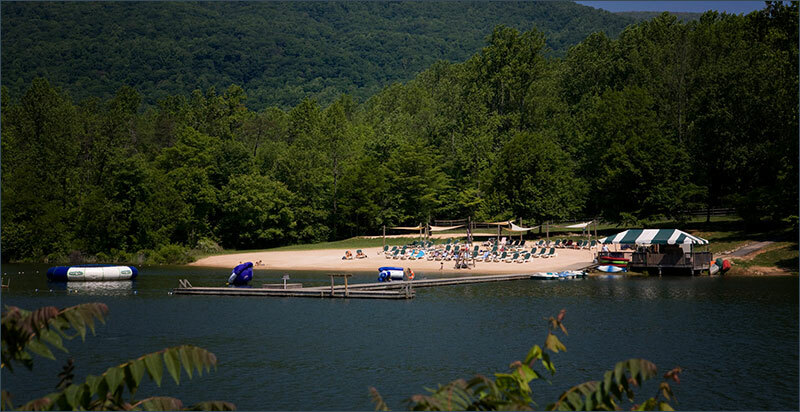 Swimming at Lake Monocan is open to the public every day except Saturday, when only Wintergreen Resort members and guests are allowed. A fee is charged for non-guests using the Monocan Park facilities.